Many Ontario Certified Teachers, like CBC Radio’s Jim Curran, are pursuing fascinating livelihoods outside teaching. How did their careers evolve, and why do they maintain their teaching ties? Guess what these people have in common: a speech-language pathologist, a university president, a sports broadcaster, a budding entrepreneur, a nurse, a self-described social justice facilitator, a publishing consultant and a traffic reporter. The fields may vary, but all of these individuals share a love for and a background in teaching – and membership in the Ontario College of Teachers. Not everyone who is registered with the College is currently teaching. A sizeable percentage of members is pursuing other interests and careers while still placing a priority on maintaining ties with the profession. Meet eight of them. Many CBC Radio listeners are familiar with the name and voice of Jim Curran, OCT. He provides the Toronto traffic reports each weekday morning on Metro Morning and each afternoon on the regional show Here and Now. What listeners may not know is that Curran is also a registered teacher. In high school he began thinking about working in radio. He remembers doing school announcements on the PA and being hired by two teachers as a technician for the school theatre. Only later did Curran learn that the teachers paid him from their own pockets, not the school budget. Curran joined the CBC in 1972 after graduating from Ryerson with a diploma in Radio and Television Arts. Although his passion was radio and his career was taking off, Curran had such respect for and interest in teaching that he decided to pursue that as well. In the time between his two shifts, he began attending classes at the University of Toronto’s Faculty of Education and earned his BEd in 1978. While he never planned to switch professions, Curran was a teacher’s assistant for three summers at the University of Toronto. He has also produced some educational DVDs for a professor there. Curran likens his long-time job to the cop who directs traffic – although by getting in to work at around 5:30 am he himself thankfully misses Toronto’s morning rush hour. Curran is not currently teaching and has no concrete plans to teach, so why has he remained registered with the College all these years? He believes that life is a circle of learning and teaching and says that, in a way, his BEd formalized that belief. As a child Connie Quinn-Vaillant, OCT, had a blackboard built by her father so she could play school with friends. “I was the teacher; they were the students,” she says. These days she’s busy with other fabrics. Quinn-Vaillant started a business called StrollMates, making and selling “cane wear co-ordinates” – fabric slipcovers for canes to turn them into fashion accessories. Education is part of my life, and if I ever had to I would go back. It’s my comfort zone. The idea for StrollMates was sparked when a cousin with MS showed Quinn-Vaillant her cane collection, which she co-ordinated with various outfits. Quinn-Vaillant thought there must be a way to express yourself and co-ordinate with your clothing while shedding the look of a clinical metal or simple wooden cane. One day in December 2008, she awoke with an idea and got out her sewing machine. “When my husband asked what I was doing I said, ‘I have to upholster a cane!’ ” The design evolved into affixing fabric around a foam tube that slips over the cane. As a bonus, the foam provides a cushion should you bang yourself (or others). Quinn-Vaillant launched the business on a shoestring. One son developed a web site, www.strollmates.com, her husband does the product photography, and she makes the covers as orders come in. She sees herself in the safety business as much as the fashion accessory business – if people think their canes look nice, they’re more likely to use them, she says. When Lorna Novosel, OCT, decided to pursue a career in speech-language pathology, it was definitely what she calls “Plan B.” After graduating with her BEd from Brock University in 1977, she ran into a “dreadful” teaching-job shortage. 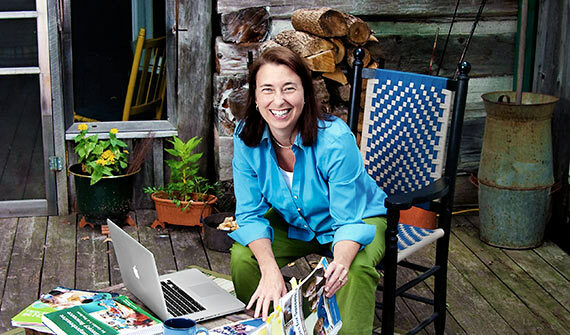 With no prospects and student loans to pay, she needed to discover what she could do next. One day, while flipping through university calendars, the field of speech-language pathology resonated. She saw a connection to education. Novosel returned to school, getting a degree in speech-language pathology from the University of Western Ontario, and then landed a job at Brantford General Hospital. Much of her work involved assessments for local school boards, and after four years with the hospital she spent another four with the Lincoln County Board of Education. After that she moved to the Dufferin-Peel Catholic DSB, where she has worked for the past 19 years. “I find language and communication endlessly fascinating,” says Novosel. “Every time I meet a child it’s a puzzle, and I’m like a detective trying to figure out how to make a fit between the child’s communication abilities and the realities of the classroom. Jaya Karsemeyer, OCT, earned her BEd from Queen’s University in 2008 and can certainly imagine herself as a classroom teacher. But for now she devotes her time to a fascinating mix of interests. “I usually call myself a social justice facilitator or teacher with a strong focus on the arts,” Karsemeyer says. At Queen’s she was part of the Artist in Community Education program, which explores the positive role that artists and the arts play in our schools, communities and society. When you’re talking about how to move from darkness to light, from hatred and opposition to love and acceptance and healing, education always plays an important role. Currently, Karsemeyer is helping to develop a curriculum on biotechnology for the Canadian Council of Churches. It will help church members to be more informed around everything from genetically modified food to stem cell research. “It’s an amazing example of good pedagogy,” she says. She’s also working on a curriculum on beginner computer programming for a community learning centre in Toronto. Karsemeyer has worked with students as a tutor, an admissions associate and support staff at Olney Friends School in Ohio (a Quaker boarding school). But her passions have kept her on the move. Through a Quaker organization, for instance, she has participated in two cultural dialogues in the Middle East, one in Jordan and Syria last year and a peace delegation to Israel and the West Bank this year. For Mary-Lynne Miles, OCT, the family business is health care. Her father was a doctor, her mother was a nurse, and her extended family includes 14 doctors, many nurses and several physiotherapists. So it’s no surprise that Miles ended up as a nurse – except she started as a teacher. After graduating from Queen’s in 1971 with her BEd, Miles taught science at Loyalist Collegiate in Kingston. She enjoyed the work and was well received but eventually felt she was getting stale. “When that happens you’re not as effective as a teacher,” she says. Miles decided to return to Queen’s to simultaneously pursue a bachelor of nursing science and a master of education, earning both in 1979. She had considered medicine before becoming a teacher but in nursing found her true calling. “I liked the hands-on caring aspect, the clinical bedside work and the counselling,” she says. I’m teaching all the time, and my teaching background helps me to present information in a logical fashion. Since 1979 Miles has worked in several settings, including a hospital in Kingston, a community care access centre in Belleville and a series of Mexican villages. “The people there couldn’t really afford health care. It was so rewarding to work with them,” she says. And she has used her teaching skills to deliver nursing courses at various colleges. For the past three years, Miles has been a nurse practitioner (NP) for the Department of National Defence, working out of Canadian Forces Base (CFB) Trenton. An NP has an expanded scope of practice, beyond general nursing, in areas like diagnosis and prescriptions. To help pay for her NP studies, Miles went back to supply teaching for a time; one reason she retains her registration is to maintain the option to teach as needed. Miles says that a nurse’s job is to help people understand how they can be the best they can be, and in a broad sense that’s what teachers do too. At 19 many students are busy juggling their course load and part-time work. Dominic Giroux, OCT, was no different – even if his duties outside class were unique for someone his age. In 1994 he was just starting undergraduate studies at the University of Ottawa when he was elected a trustee of the Ottawa French Catholic school board, the conseil des écoles catholiques du Centre-Est. Two years later, at 21, Giroux became chair of the board. 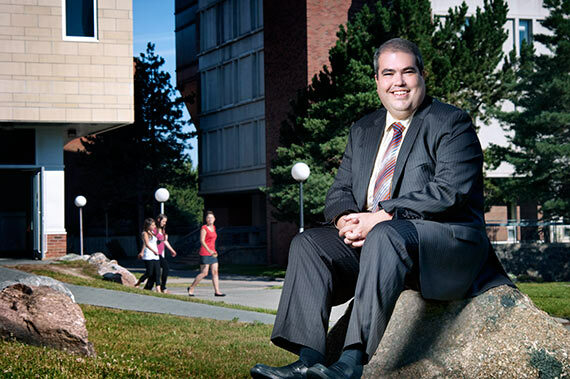 In April 2009 he was appointed president of Laurentian University in Sudbury – from first-year university student to university president in just 15 years. Although he has been on the fast track, Giroux, the son of two teachers, didn’t always envision a career in education. “I was admitted to law school in 1998 and had already bought my books,” he says. But then the newly formed conseil scolaire de district catholique Centre-Sud, which brought together 45 French-language schools in southern Ontario, was seeking a chief of staff to the CEO. Giroux got the job. He left to get his MBA from École des Hautes Études Commerciales in Montréal and joined the Ottawa French Catholic school board in 2002 as chief financial officer. “I had to answer all the questions that I used to ask as school board chair,” he says. Although he was well versed in school board operations, Giroux felt that teaching experience would be invaluable. So he pursued a BEd from the University of Ottawa. At one point he did his teaching assignment during the day and then did his “day job” with the board at night. Giroux was later appointed Assistant Deputy Minister (ADM) with the Ministry of Education and the Ministry of Training, Colleges and Universities, prior to being named Laurentian’s president. “My father once told my brother and I not to follow sports because it will never put a dime in your pocket,” recalls Paul Jones, OCT. Not quite. Both brothers ended up in sports broadcasting – Mark Jones with ESPN and ABC and Paul Jones with (among others) TSN, CTV, Rogers Sportsnet and the Fan 590 radio, where he currently does play-by-play of Toronto Raptors basketball games. Jones also does the pre-game and post-game shows for Raptors TV and writes for sportsnet.ca. Not bad for a vocation that started out as a sideline to his teaching career. Sports was always in Jones’s blood – but so was education. In fact, his grandfather was a principal in Jamaica. 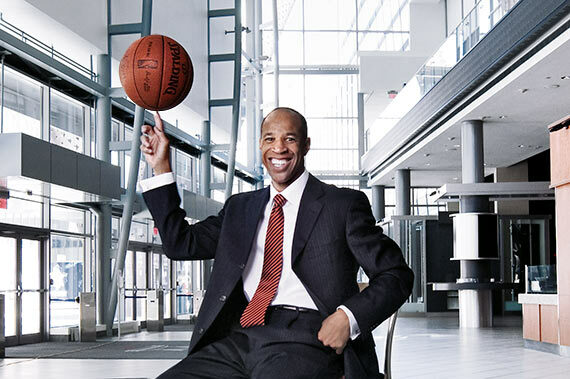 Jones was a star basketball player at York University, where he graduated with a BSc in 1980. He went on to earn a BEd in 1982 and a master’s degree in sports psychology in 1984 – both from the University of Western Ontario. Jones got jobs supply teaching and was playing basketball in Europe when his brother, who was working part-time at TSN, told him about an opportunity at the sports network. “They pay you to watch games!” is how he excitedly described it. In 1985, the same year he landed a full-time teaching job in Toronto, Jones got work at TSN writing highlights. His teaching and broadcasting careers progressed in tandem. Jones remembers handing out TSN pens to students who got good marks. Years later one former student, who ended up working for Sportsnet, said he never forgot receiving one. Of course, juggling the two careers wasn’t always easy. In 1994, just after he had been promoted to vice-principal at his school, Jones was asked to be the analyst on Raptors broadcasts on Toronto radio station CFRB. At first he travelled with the team, though in later years he did only home games. Jones spent more than two decades in education, as a teacher, vice-principal and principal. A few years back he decided to focus solely on broadcasting but has kept his registration with the College and doesn’t rule out playing a role in the field in future. “I still love teaching,” he says. When Nicole Thibault, OCT, began her teaching career in Ottawa in 1987, she liked the time she spent in front of her students. But to Thibault – who taught Core French and French Immersion – the best part of the job happened outside the classroom. Thibault eventually became an education consultant for French as a Second Language (FSL) and has also been a vice-principal. But thanks to a series of secondments from the Ottawa-Carleton DSB, she has been able to pursue the areas of education that play to her greatest strengths and interests. She spent three years as a consultant with Ontario Agri-Food Education, an organization that, among other things, provides resources to educate Ontario students about food and the food system. For another three years, Thibault was a sessional instructor at the University of Ottawa’s Faculty of Education. And from 2003 to this year, she was Executive Director of the Canadian Association of Second Language Teachers. In June 2010 Thibault began a new job as an FSL education consultant for Nelson Education, a leading Canadian publishing company. She is now working on linking the latest practices and research in second-language teaching into new educational resources. As someone who has spent most of her career outside the classroom, Thibault recognizes that just about every workplace has a teaching and learning component. She says that the abilities she has developed as a teacher – people skills, communications, training and facilitating – are highly transferable and valuable.